Author: Al-Amin Abu-Manga. Series edited by: Herrmann Jungraithmayr, Norbert Cyffer. 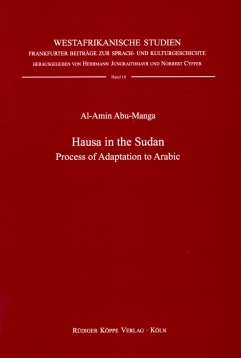 This volume describes and analyses the various linguistic and sociolinguistic changes and developments in Hausa as a result of its close contact with Arabic in the Sudan. In particular, the study focuses on those changes which have occurred through direct contact between speakers due to migration, such as the settlement of Arabic-speaking pilgrims in the Sudan on their return from a pilgrimage to Mecca. The study thus concentrates on the least explored relationship between Sudanese Arabic and Sudanese Hausa – the influence through direct contact of the speakers – but also considers the more commonly explored links between the two languages, i.e. their genetic relationship and the indirect contact through common Arabic literary traditions. The first chapter provides an introduction to the history of Hausa migration and settlement in the Sudan as well as to the methodological approach and to theoretical considerations of language contact. Chapters 2 and 3 deal with the more commonly explored links between Sudanese Arabic and Sudanese Hausa, those of genetic relationship and indirect contact through literary traditions. Chapter 4 analyses adaptation processes of Arabic sounds to Sudanese Hausa as well as the various linguistic phenomena resulting from these. Chapters 5 and 6 focus on the adaptation of Arabic nominals and verbal stems to Sudanese Hausa patterns. A final chapter deals with the semantic changes and anomalies with Arabic words and expressions borrowed into Sudanese Hausa and used with a different meaning. The study concludes with an account of the increasing Arabic influence on Sudanese Hausa to the detriment of its mutual intelligibility with West African (mainly Nigerian) Hausa. The book is a very significant contribution towards African sociolinguistic research and considerably enriches our knowledge on the variety of Hausa spoken in the Sudan.